The Pentagon has successfully carried out its first ever test-intercept of an unarmed missile fired over the Pacific. The target missile was launched 4,000 miles (6,400km) away from where two interceptor missiles were fired in southern California. The first interceptor missile hit and destroyed the target, and the second interceptor missile hit a remainder object, as it was expected to. The exercise is a practice for real missile threats from the likes of North Korea. The two interceptors were fired from Vandenberg Air Force Base in California. The target missile was launched from the Reagan Test Site in the Marshall Islands. 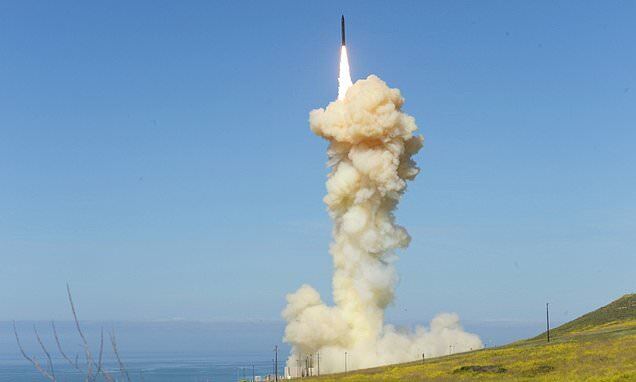 'The system worked exactly as it was designed to do,' said Air Force Lt Gen. Samuel A Greaves, director of the Missile Defense Agency. Even though the missile defense system has been operating for more than a decade, this was the first time it had attempted to fire multiple interceptor missiles at a single target.